This architecturally significant home saved, preserved, enhanced, and extended is the most remarkable architectural preservation achievement I have seen. This post will finish the series on Max Levy designed city homes over four decades. I look forward to posting examples of his new work and sometime in the future a series of Max Levy country houses. This last post shows a photograph of the connection between the original Steven Holl architect-designed Stretto house and the three bedroom extension designed by Max Levy on the adjacent one-acre lot. The most obvious goal of renovating the original home and adding onto it was not to diminish the brilliance of the original house. The next goal was not to detract from its architecture and then aspirationally how to create something significant by deferring to the original home. Max Levy was successful. Cascading water over a series of small creek dams was the nature element of the original house with its swooping roof lines and perfectly framed vignette of the creek, ponds, and pools through glass openings on two sides of the house. The hierarchy of spaces also included the service and utility areas that became darker and more grim as they were funneled towards a carport corner of the house. 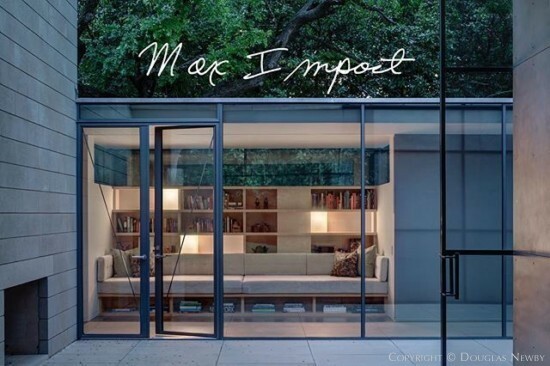 Max Levy transformed them to light-filled spaces with a minimal connection to the sleek extended rectangular space that knifes through the adjacent hill. Here, every bedroom has its private porch and view over the rolling land. Water is the inspiring element of the original home. The sky is the defining element of this Max Levy, FAIA, designed extension. A seemingly implausible project became a success on many levels.